As the small aircraft dips its wings over the landscape, one is struck by the mosaic of patterns: a hodgepodge of greens, blues and browns woven together as the largest inland Delta in the world, the Okavango. Gazing down at one of the world’s last great wildernesses where huge herds of elephant, renewed populations of rhino and grand prides of lion find their meals, it’s treasure to visit this pristine landscape, staying in some of Africa’s smallest, most remote and most sought after camps as a respite from the hustle and bustle of modern life. After a few days in the Delta, one crosses over Botswana’s contrasting landscape and heads deep into the Kalahari where Bushmen still follow their traditional way of life, among the large zebra herds and peeking meerkats. The bounty that is Botswana is capped off by a final stop along the great Chobe river, surrounded by dense forest, but teeming with elephant, buffalo and the spirited calls of African wild dog and the telltale nightly call of the leopard. As the aircraft returned to civilization, with a final stop at the mighty Victoria Falls, one’s souls feels renewed despite rising early each day to catch the sunrises and explore by foot, vehicle and canoe, the hidden corners of this vast country. It reveals experiences one believes only live in the mind’s eye. A slightly less easy family destination as most camps require children to be at least 6 to go on game drive; however, there are a number of family rooms available at a variety of lodges. Synonymous with the word safari, it’s impossible to think of this equatorial gem without visions of wide-open plains dotted by lone acacia trees and large herds of wildebeest. 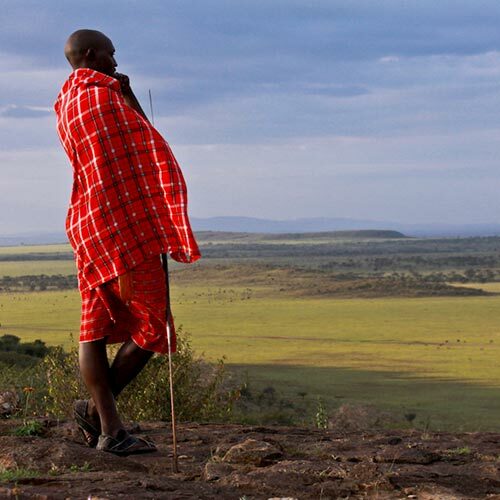 This vision is real here, and it’s the Maasai Mara. Home to arguably the finest wildlife on earth, this grazing wonderland hosts the most remarkable volume of both prey and predators. 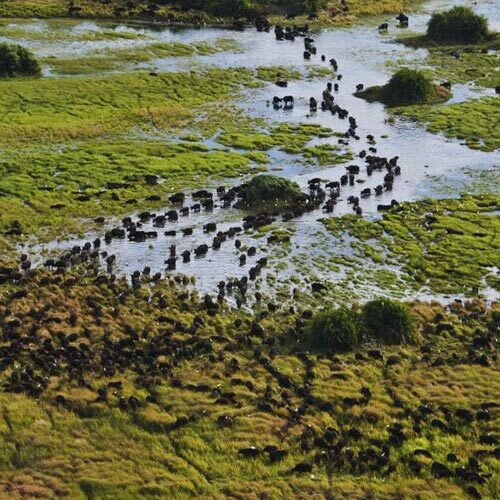 As one glide over the Talek River in a hot air balloon, spotting elephants on the move, and hippo bobbing their heads, you look south toward the Mara River where millions of wildebeest cross in search of new grass. Once satiated on this wildlife wonderland, a flight southeast to the shadows of Africa’s highest peak – Kilimanjaro – reveals a green tapestry of marshes teeming with elephants. As if that were not enough, further afield, up north, now in the shadows of Mt. Kenya, one discovers Kenya’s alter ego – more dry, more seasonal, lesser known – this is a matrix of private reserves and wild characters, where rhinos and wild dog mix with regional endemics like gerenuk and Grevy’s zebra. This wild west of Kenya makes for a safari trifecta which is unrivaled continent-wide. Year-round excellent, with seasonal rains typically April to mid-May and November to mid-December. Wide variation in temperatures due to elevation. All major species, with specific emphasis on the Great Migration, and high densities of predators. Regionally specific sightings of rhino and wild dog. Regional endemics such as gerenuk, Grevy’s zebra. Arguably, the BEST family safari destination on the continent. Excellent range of activities, interaction with local people and camps and lodges that cater beautifully to kids. It’s dramatic here. Contrasts. Harshness. But one finds the most amazing adaptations in the life that thrives here: from tiny trap-door spiders to huge pachyderms, Namibia may appear devoid of life in its desert landscape, but a voyage there reveals a place of sharp colors, captivating stories, rushing rivers, crashing waves and rocky ridgelines. Accessible by overland or air, the highlights are endless and divergent. 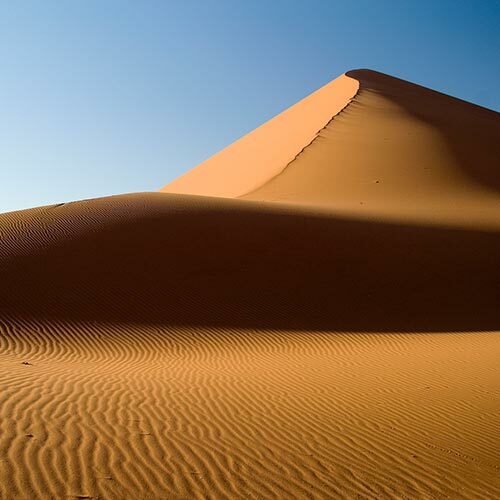 One wakes early to catch the sun rising over iconic Sossusvlei’s sand dunes in glowing orange. From the summit, one feels merely like another grain of sand in the vast sea. Then, a quick jaunt west, and it’s the funky coastal town of Swakopmund for some fresh seafood and a beach horseback ride. Continue north, to Etosha, and sit quietly by giant saltpans as hundreds of antelope come for a drink only interrupted by the strut of lion and the barreling arrival of elephant. Later, back on the shores of the Atlantic Ocean, get down on all fours, and discover beautiful little rock crystals and bizarre desert-adapted plants. Or the smell of the Himba village – the way the world seems so simple when holding a baby in arms. The next morning, as waves crash around a seal colony, pups bark in alarm over a rampaging jackal. Finally, a deck view across the Kunene river to Angola reminds one of the interesting history of this remote German outpost: from border wars with the Portuguese, to its German roots, and its recent independence from South Africa. Generally pleasant year-round, Namibia’s rainy season – consisting of very little measurable rainfall, and highly localized – is November to April. Winter is cool, even freezing at times, but is flanked by the very pleasant months of May, September and October. All major species plus regionally prominent desert-adapted elephant, oryx, springbok, rhino, cheetah; not likely to see leopard, wild dog. An excellent choice with very little age restriction on activities,lodges with family-friendly rooms and great countrywide infrastructure. There is perhaps no more humbling experience than to be in the company of these gentle giants. Moving quietly yet with a commanding presence, one sits, stunned, by being in such close proximity to such a legendary species. It’s seen far too much in its day – from war to genocide to habitat destruction – and its eyes tell a story. Some kind of familiar story. A true gift to have this chance, it is one not be missed. It changes one’s perspective. Year-round, with higher likelihood of at least some rain November through May. 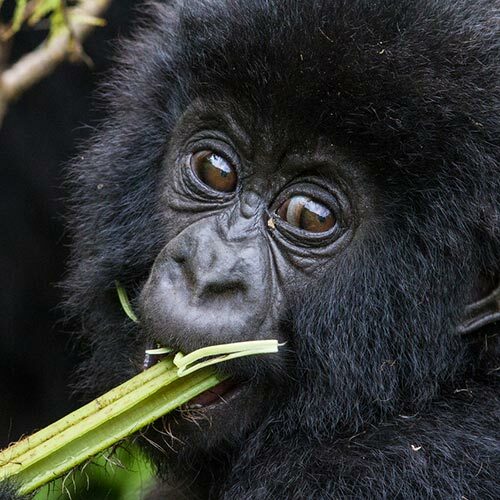 The appeal of this California of Africa is broad…it’s possible in one two-week trip to experience fine dining, world-class wines, big ocean, spectacular hiking, dense wildlife and rich culture all framed by mind-blowing scenic beauty. This is where the infamous safari bug bites many first-time safari-goers: a foray here merely whets the palate on the opportunities available for safari elsewhere on the continent. It starts its affliction in the Kruger National Park and Sabi Sands region, where in one single day it’s possible to see (though not every one may) the Big Five, making it indisputably one of the continent’s most renowned safari locations. Combining it with the lesser known, but equally as rewarding destinations in the Kalahari and northern Cape where unique sightings of wild dog, meerkats and desert-adapted species make for an appreciation of the wild diversity of this country’s wildlife. After those early mornings on safari, it’s nice to take on the real holiday mode with a cruise down the Garden Route, exploring magnificent old Yellowwood forests, character-filled farmhouses, stunning coastline and friendly people. The final resting place on this remarkable safari is the award-winning city of Cape Town. Its setting defies imagination and the richness in history, culture, food and wine makes it a place worth a two-week stay on its own. Excellent year-round, with very regional weather variations so it is not even possible to pinpoint a “best”. The Southern hemisphere winter can be quite chilly up in the Kruger and northern Capes area, and rainy in Cape Town, though. 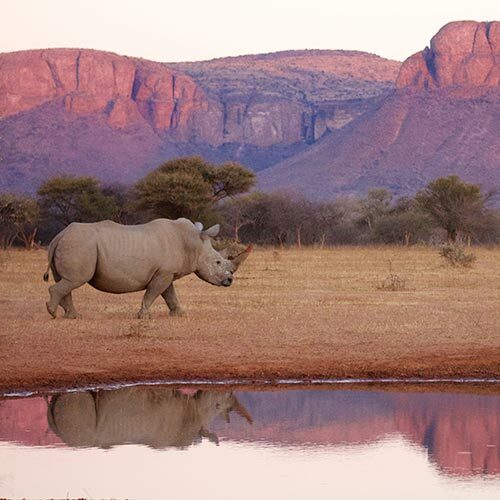 All major species, and particularly good for guaranteed sightings of leopard and rhino. Endless; an absolute gem for families with its wide range of offerings and very hospitable culture toward children. Point oneself in any direction in this safari frontier – north, south or west – and discover a safari circuit unlike the other. Without fail, one must see the Ngorongoro Crater and its verdant highlands featured alongside the vast plains of the Serengeti National Park and baobab-studded landscape of Tarangire. But to dig deeper into this iconic destination, one heads south to the low-lying riverine woodland of Africa’s largest game reserve, the Selous, and then carries on to its arid cousin, Ruaha. As if that diversity were not enough, climb on a charter plane west to the deepest darkest parts…. the west. 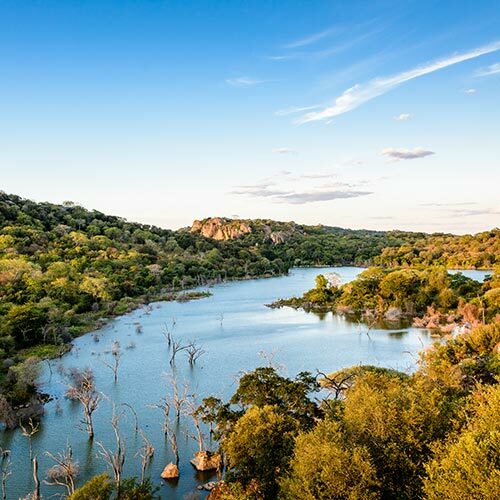 Here, the raw nature and beauty of Katavi will boggle even the most ardent safari-goer as hundreds of crocodile and hippo wallow in the dry-season mud of the seasonal river and herds of buffalo thousands strong stomp the land. And once done with the safari highlights, then go further to the shores of Lake Tanganyika where the Mahale Mountains jut from the lake’s edge, and its resident where chimps swing and saunter. Round it off with a beach holiday in Zanzibar, snorkeling some of Africa’s finest reefs. This juxtaposition of experiences makes Tanzania the single most diverse safari destination. Year-round excellent, with seasonal rains typically April to mid-May and November to mid-December. Wide variation in temperatures due to elevation. Best recommendations for safari location in the Serengeti are seasonal, based on wildlife movements. All major species, with specific emphasis on the Great Migration, and high densities of predators. Rare sightings of rhino and wild dog. It’s easy to believe that a country as massive as this hides many of the best safari secrets. Most known for its portion of Victoria Falls, if one goes beyond that well-known site, it will unveil some of the wildest, richest and most genuine safari opportunities. Forming the border between Zambia and Zimbabwe, one’s adventure begins with a thrilling canoe down Lower Zambezi, the lifeline of the park of the same name. Weaving between hippo pools and the crossing elephants, this park is a perfect start to revealing the diversity of this country. Then take off north, flying west to another of Zambia’s huge parks: Kafue. Seasonally flooded, the wildlife-rich Busanga plains are home to tremendous herds of lechwe and buffalo, fringed by diverse woodland species. Pairing this park with the better known South Luangwa, the birthplace of the most famous of Africa’s walking safaris, is to experience the richest of the country’s wilderness jewels. Walking through the magical ebony forests and high cut banks of the Luangwa River harkens back to the real safaris of yesteryear when safari was done entirely on foot. For the intrepid, soaring north, the huge Lake Bangweulu is a birder’s paradise, typified by marching through the mud for a sight of the African Shoebill and the endemic Black lechwe. On departure, one is left with a feeling of awe, but also a desire to come back to this undiscovered treasure and carry on exploring North Luangwa and the just emerging destination of Liuwa Plains. Like Zimbabwe, the green season is Nov – May, with regional variations in rainfall. This is also when the Busanga Plains and Bangweulu Swamps are least to even inaccessible. Dry season starts in June, and gets increasingly hotter through October, with temperatures variable by elevation. Most major species, with exception of rhino. Some regional specials are: African Shoebill, Oribi, Blue wildebeest, Lichtenstein’s hartebeest, Puku. Due to its focus on a wide variety of activities, and large distances between parks, not the ideal choice. As the cool mist hits one’s face, it feels for a moment as Livingstone must have felt as he set his sights on this magnificent waterfall for the first time: humbled, present and in awe. What a grand start to a safari adventure through one of Africa’s most tragic, yet inspiring nations. With a richness of resources unrivaled by its neighbors, Zimbabwe shines for its history of great safaris, exploration and wild experiences. A start with canoeing down Zambezi, walking among the great elephants of Mana Pools, experiencing eight mammal species at the same time at a waterhole in Hwange, hiking the spectacular granite batholiths of the Matopos and finally reaching the remote and exclusive wilderness wonderland of Gonarezhou. Renowned for its “best in class” guiding, and the humor of its people, a safari here fills one’s cup of laughter, learning and a sense of awe. In the end, the voyage leaves one curious about the resilience of Zimbabwe’s people and natural heritage, and forever changed by exceptional wildlife sightings, and stunning landscape. As the locals say, “make a plan” and get on safari in Zim. 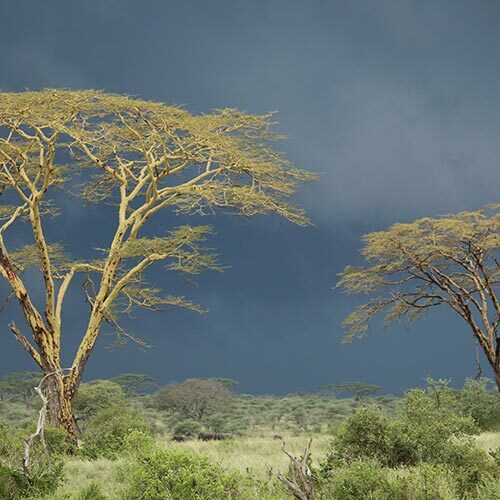 Like Botswana, the green season is Nov – May, with regional variations on rainfall based on elevation. Dry season starts in June, and gets increasingly hotter through October. 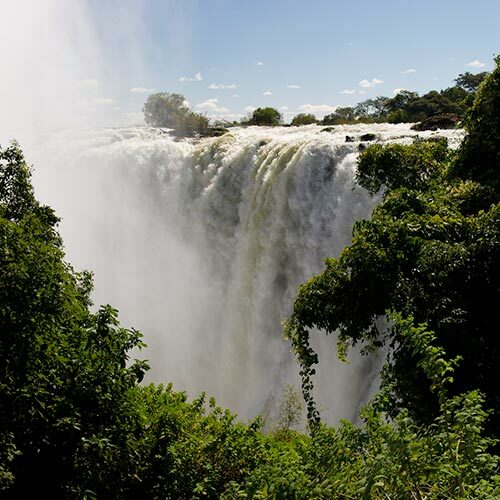 For the highest volume of water over Victoria Falls, then February to May is your best bet; however, it can be so voluminous that it impairs your view, so a nice middle-ground tends to be July & August. Zimbabwe also has the best year-round viewing points. All major species. Rare sightings of rhino and wild dog. A slightly less easy family destination as most camps require children to be at least 6 to go on game drive and older for walking; however, there are a number of family rooms available at a variety of lodges.